Maps, the prime tools of navigation, are fundamental to exploration. Also, improving existing maps or developing new maps of uncharted areas are often major exploration objectives. In keeping with the "Century of Change" theme of the Harriman Retraced Expedition, here we offer a set of historical maps that date to the era of the original 1899 expedition. These are complemented by a set of maps that depict the itinerary of the 2001 and original expeditions against a backdrop of contemporary information on the topography of Alaska and bathymetry of surrounding marine waters. 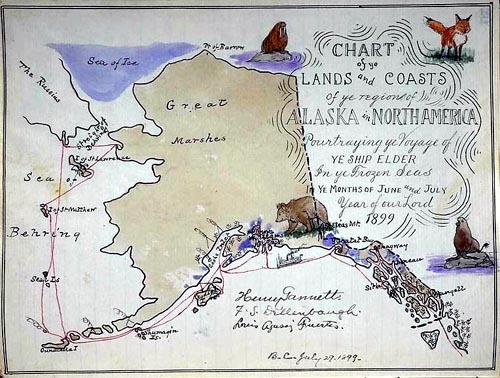 This series of historical maps shows the route of the original expedition and several detail maps of Alaskan glaciers developed by Henry Gannett and G. K. Gilbert from information gathered during the 1899 expedition. Example of historical map. 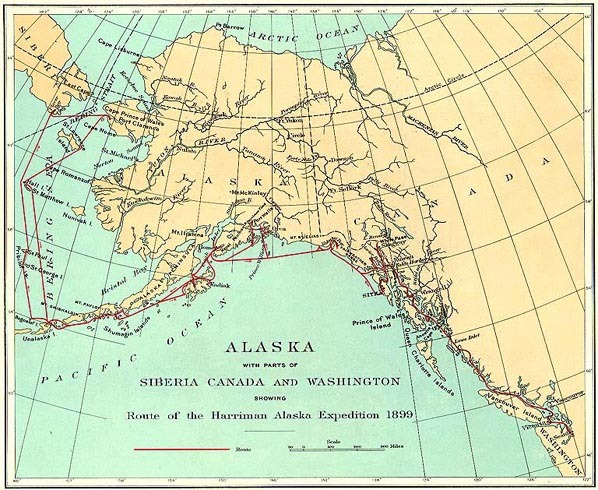 Map of the route of the 1899 Harriman Alaskan Expedition. These five maps depict routes of the 1899 and 2001 expeditions. 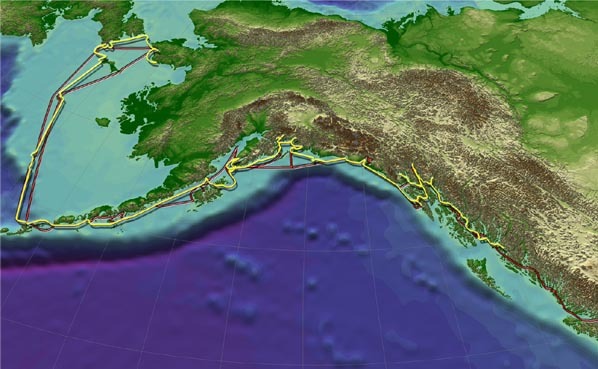 The entire route is shown on a single large map, supplemented by a series of four higher resolution maps showing the expedition in four regions of Alaska: the southeast, south central/Gulf coast, the Alaska Peninsula and Aleutians, and the Bering Sea coast. These maps also provide detailed information on specific points on the route, such as Glacier Bay and St. Paul Island. Example of three dimensional perspective view of the Gulf of Alaska with expedition routes. 1899 expedition in red, 2001 expedition in yellow. 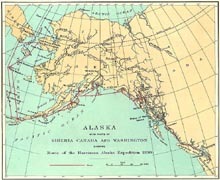 Map of the route of 1899 Harriman Alaskan Expedition. Prince William Sound is shaped like a great spider: an open irregular body of water eighty miles or more across, fringed by numerous arms and inlets that reach far in amid the mountains. Across the head of most of these arms are huge glaciers; others hang upon the mountain sides, or cascade down them. John Burroughs, Harriman Alaska Series, Vol. I.